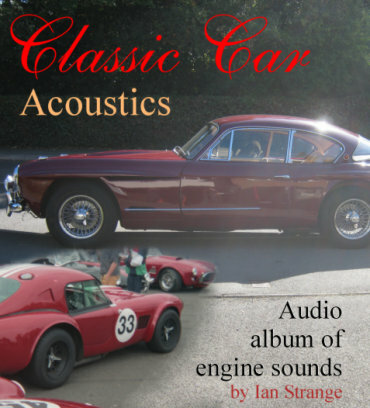 Classic car engine sounds recorded in the UK. Do you shed a tear when hearing a classic Ferrari V12? Does your spine tingle to a big Ford V8? Or do you swoon to a Jaguar straight 6? If so, you are in the right place! Makes/models featured include AC, DB Aston, Big Healey, Daimler SP250, XK Jaguar, Scimitar, Triumph TR6 and Stag. Also includes, V12 Ferraris, Ford Mustangs, Sunbeam Tigers, a BRM V16, straight 8 Bugatti, and much more. Running time approximately 125 minutes. 153 recordings. Mostly recorded in the 1980s/90s, during rallies along country lanes, at hillclimbs and sprints, and some private recording sessions. *** Over 20 AC Cobras starting up. *** A straight 8 Bugatti Type 55, so ferocious that it shakes the listener by the shoulders and tosses them out of their arm-chair... okay, I'm exaggerating. It sounds good and loud! *** An AC Ace hotly pursued by a Ferrari 275GTB. *** A Sunbeam Tiger wakes up the countryside! Ferrari 275GTS passes and more classics approach. 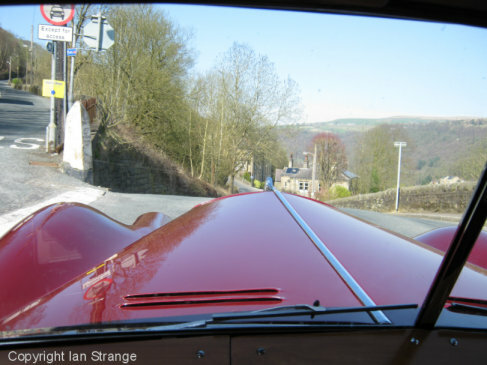 1 - Heard from opposite the turning, a dark green Jaguar C-Type pauses, and then blasts down the side road. 2 -	A green Healey 3000, dark red E-Type and a white BMW 328. 3 - A white (and loud) XK120 followed by a few other cars. 4 - A dark blue Daimler SP250, then a blue SP250 over-shoots the junction, as other cars pass including another (red) SP250. The blue car reverses back and then accelerates swiftly down the side road. Edited sequence. 5 - A smooth sounding dark red MGB GT V8 passes. 6 - Now heard from down the side road, a dark blue Stag pulls into the roadside, and a red TR6 passes before the Stag pulls away. Another red TR6 trundles up slowly before accelerating. 7 - A white Porsche 911 can be heard idling down at the junction, as a nickel coloured Mercedes 280SL and a blue/white Healey 3000 pass. The 911 then follows up. 8 - A green Jaguar mark 2 glides smoothly by. 9 - A nice and loud black Porsche 911 blasts by followed by a yellow TR6. 10 - A Reliant Scimitar moves up to the start-line and begins a timed run. 11 -	A dark red Aston Martin DB2/4 roars up the hill through Castle Gresley. 12 - A dark blue Allard with Ford V8 engine, rumbles by. 13 - A competition version of the Healey 3000 blasts by making a superb racket. 14 - Aston Martin DB5 (red) accelerates passed. 15 - 3 red cars in succession. A TR3 has a pair of Ferraris hot on its heels, a 275GTB and a 275GTS. 16 - In very wet conditions, a dark metallic grey Ferrari Dino gets off the start line, and marshalls sweep away mud. 17 - A silver BMW 328 accelerates passed, towards Walton from Bruntingthorpe. 18 - A ride in a grey 1935 AC 16/70 4 seater sports, courtesy of owner Derek Bray. We pull away from Stoughton village, Leicestershire, with the sounds from the pre-selector gearbox quite evident. 2nd October 1989. 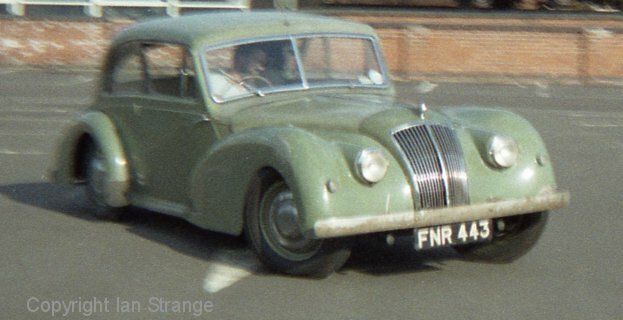 19 - The sound recordist drives his green 1949 AC 2 Litre Saloon up a hill in Oadby, Leicestershire. 8th October 1989. 20 - The famous 24 litre Napier-Bentley (W-12 cylinder Napier Lion aero-engine), accelerates down the start/finish straight. It is pursued by a group of 3-wheeler Morgans, looking and sounding like a swarm of bees chasing a large bull! 21 - The Napier-Bentley and Morgans pass again. Each time, the Bentley out accelerates the Morgans, which then catch up under braking. This was during the "Vintage Race" (presumably cars from 1918-30). 22 - Event no.8 (handicap race for larger engined cars) gets under way, heard from Copse Corner. A Lister-Jaguar drowning out a red AC Cobra 289, a white Lister-Jaguar plus some other cars including Morgans, a black Cobra 289 goes up through the gears and some MGs pass by. 23 - A white Metro 6R4 and a blue AC Cobra mk.3 289, flash passed. 24 - A red Porsche 911 convertible and a white Sunbeam Tiger, get off the start line. 25 - The above 911 flashes by at high speed. 26 - A silver Bentley Special cruises by. 27 - 3 Sunbeam Tigers (white, dark blue and light blue) leave the start line. 28 - The first 2 of the above Tigers tear passed. 29 - A white Metro 6R4, a blue Cobra mk.3 289 and a silver AC Ace Bristol, start their respective laps. 30 - A dark green Triumph TR5 passes swiftly. 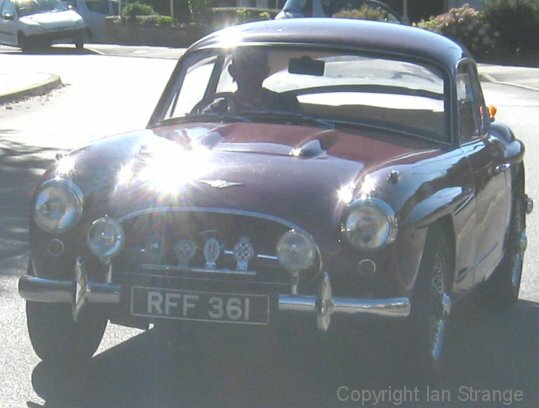 31 - A gold coloured Sunbeam Rapier approaching, is over-taken by a silver Cobra 289 that blasts by. 32 - A lovely light blue Aston Martin DB4 accelerates by very rapidly. 33 - A metallic blue DB5 passes. 34 - A brown Bristol 406 accelerates quietly passed. 35 - A black Cobra 289, another car, then a light metallic blue DB5 Volante. 36 - An E-type 3.8 (light metallic blue) passes. 37 - A red Jaguar XK140 drophead sneaks up quietly and then accelerates. 38 - A white Triumph Stag starts and departs Abbey Park, Leicester, during an historic transport rally. 39 - A black Stag turns and motors off down a country lane in Leicestershire. 40 - The above Stag drives off again. 41 - Now onboard the black Stag, we join the A6 at Great Glen, hood up. 42 - A white Morgan Plus 8. 43 - A blue Reliant Scimitar GTC. 44 - A gold coloured TR7 V8. 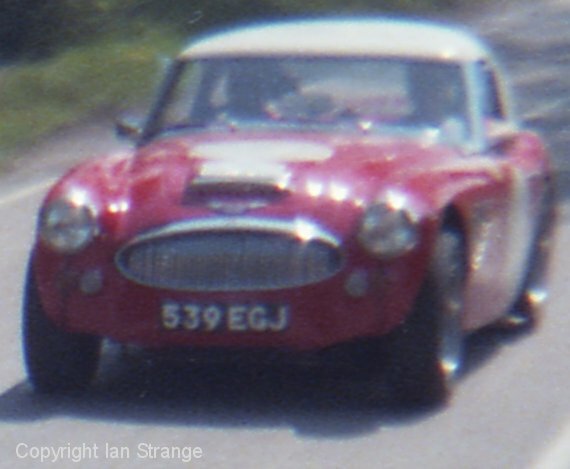 45 - A red Austin Healey 3000. 46 - A white Jaguar XK140 fixed-head coupé. 47 - A red Clan Crusader. 48 - At the bottom of the hill, a white XK120 heads to the exit at lunch-break, as another competitor passes in the foreground. 49 - An MGB GT V8 (BL harvest gold coloured) tyre-screeches up to the start line and then begins its timed run. 50 - Metallic blue Ford GT40. 51 - A convoy of competitors head down hill, with the BRM V16 sound dominating, followed by a dark blue Maserati and other cars. 52 - The glorious straight-8 sound of an Alfa 158. 53 - Dark blue Ferrari 250GTO. 54 - Green 1952/54 Ferrari Thinwall Special, red/pale blue 250GTO, dark blue DB4GT, metallic green Aston Project 214 and dark green BRM V16. 55 - A down hill convoy led by the Thinwall Special and the BRM V16. 56 - Green Maserati 250F/54. 57 - Dark green 1952/57 HWM. 58 - Red 1958 Maserati 250F. 59 - Light green ERA RIA. 60 - As part of a modern supercar demo run, we hear a red Ferrari F40 and a silver Jaguar XJ220. 61 - Red Aston Martin Virage (demo run). 62 - Dark metallic green Aston Martin Vantage (demo run). 63 - Dark metallic blue Lamborghini Diablo (demo run, but managed a time of 58.02 seconds). 64 - Dark green Aston Martin DB3S. 65 - Dark blue Ferrari 250GT (course car). 66 - A relatively new F1 Ferrari is heard heading into the distance down hill. 67 - McLaren-Cosworth F1 cars going down the hill, 1970 M14 and then a 1976 M23, both in black/gold livery. 68 - Red Maserati 250F. 69 - Red 1949/50 Ferrari 166MM Barchetta, red 1950 Healey Silverstone, dark blue 1950 Fraser-Nash LeMans Replica, BRM V16 revs in the distance as a dark green XK120 passes, then a black 1953 Fraser-Nash Targa-Florio, red 1953 Ferrari 250MM, white 1960/61 Jaguar Mark 2. 70 - An Alvis Speed (20?) and a blue Jaguar D-Type. 71 - A white Jaguar XK120 arrives. 72 - A light metallic blue modern TVR happens to pass as a black XK120 arrives. 73 - A very loud Jaguar XK150 (white) departs. 74 - A white Ford Galaxy arrives. 75 - A metallic red DB2/4 heads off the wrong way, turns around and comes back, as a metallic blue/white Healey 3000 waits and then departs. Edited sequence. 76 - A red Healey 3000 and a metallic grey mark 2 Jaguar depart. 77 - Another red Healey 3000 is heard departing twice. Edited sequence. 78 - A white E-Type and a dark green XK120 fixed-head coupé. 79 - A red Daimler SP250. 80 - Another red SP250 pulls over, allowing a nickel coloured DB5 to over-take. 81 - A red DB5 arrives and a metallic red DB6 leaves. 82 - A blue DB mark 3 convertible, dark red DB mark 3, Honda S800 and a red E-Type 4.2. 83 - A black Rover 95 and 2 Austin Healey 3000s (black and light metallic blue) followed by a Ford Sierra. 84 - A metallic blue Jaguar mark 2. 85 - A pre-war Lagonda (dark green) departs. 86 - A dark green AC Ace (AC engined) makes a rapid departure with a red Ferrari 275GTB in hot pursuit. A white MGC Roadster follows up. 1 - A black Bugatti Type 55 (with a Jean Bugatti styled roadster body and a straight 8 engine), growls and snarls its way into the Ragley Hall grounds and parks up as the course car. 2 - A red Ferrari 250GT TDF starts its timed run. 3 - A light blue Triumph TR7 V8 gets off the line. 4 - Bright red Porsche 911 convertible. 5 - Dark blue Reliant Scimitar. 6 - Red Scimitar gets off the line. 7 - Red AC 428 Fastback. 8 - The Bugatti course car heads up the hill. 9 - A cream coloured AC Aceca Bristol at the start line. 10 - Dark green AC Ace 2.6 (Ford Zephyr engined). 11 - Metallic blue Ferrari Testarossa. 12 - The black Bugatti motors down the hill leading a convoy of competitors. 13 - The Ferrari 250GT TDF starts up, before the owner realises his racing numbers are still on the car. 14 - The 250GT heads to the entrance and is faintly heard blasting down the road. 15 - A dark red 1966 TVR Griffith and then a 1953 red Tojeiro Bristol (LOY 500). 16 - Red Ford Falcon, red HW Alta-Jaguar (1948/53), and a purple AC Cobra 289. 17 - A 1952 metallic green DB3, dark green C-Type and a 1954 red Lancia D24, plus the dark blue Ferrari 250GT course car following up. 18 - A metallic green Aston Martin DB3S (1955). 19 - Another 1955 DB3S and then a 1950/53 BRM V16. 20 - A 1956/57 metallic blue Jaguar D-Type. 21 - Red Maserati 300S and metallic green Aston Martin DBR1. 22 - Another 300S (dark red), a 1965 dark green Lotus-Ford 40, red Maserati Tipo 60 "Birdcage", red Ferrari 275LM (1964), dark blue Lotus-Climax 15 (1959). 23 - The Ford GT40 again. 24 - Metallic blue D-Type. 25 - An impressive down hill convoy of competitors: Lister-Jaguar, DB3S, DB3S, BRM V16, D-Type, DBR1, D-Type, DB3S, 250S, D-Type, 300S, 300S, Lotus 40, Lotus 23, Lotus 15, 275LM, GT40, Tipo 60, D-Type, 500TRC, Lotus 30 and another DB3S. 27 - Dark green HWM-Jaguar. 28 - Dark red 1948 Alfa-Romeo 158. Pure music! 29 - Red Ferrari 250GTO (1962). 30 - Silver light-weight E-Type, Ferrari Thinwall Special, dark blue Cooper-Bristol (1952). 31 - Red/pale blue Ferrari 250GTO (1964). 32 - Dark green HWM-Jaguar (1952/57). 33 - Dark blue Aston Martin DB4GT. 34 - A 1963 metallic green Aston Martin Project 214. 35 - Down hill convoy: Thinwall Special, Alfa 158, Cooper-Bristol, HWM, DB3S, DP214, DB4GT, E-Type, Connaught, E-Type, 250GTO, 250GT TDF, 250GTO, 250GTO, 250GT (course car). 36 - Metallic green Jaguar XK120. 37 - Red/white Austin Healey 3000, competition version, white XK120, white Lotus(?) and a metallic grey Porsche 911. 38 - Red Jaguar XK120 and red Austin Healey 3000. 40 - A pair of red Austin Healey 3000s pass in the opposite direction to the rally. 41 - A rare (metallic blue) Aston Martin DB4GT light-weight (reg. no. 40 MT). 42 - Pale metallic blue E-Type 3.8 Roadster. 43 - Blue BMW 507, silver Mercedes 300SL, white Healey 3000 and a white Porsche 912. 44 - A pair of Healey 3000s (red and blue/white), red MGA, an unidentified car, another red Big Healey and a red Mercedes 300SL. 45 - With the sound of a V12 Ferrari in the background (on the runway), a red MGB passes, and then a dark green AC Ace (AC engined), plus another car, followed by a light blue Alvis, another car, a black Daimler SP250 and others. 46 - A white early Porsche 911 does a 3-point turn near the mic, and then a dark red DB5 passes. 47 - As a cyclist heads by, a red Ferrari 275GTS accelerates passed, and then a white E-Type 4.2 with a red Ferrari 275GTB close behind. 48 - Dark red TVR 350i. 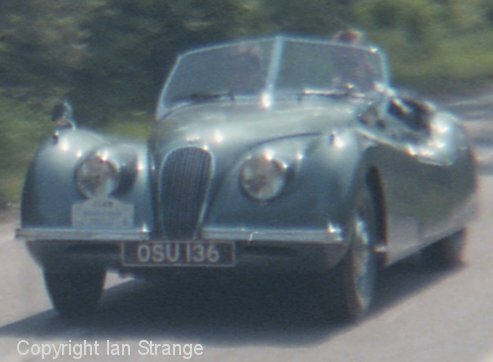 49 - Light blue Jaguar Mark 10 and a red Ford Mustang cruise gently passed. 50 - Dark brown Scimitar convertible. 51 - A red Gordon Keeble. 52 - Blue/white AC Cobra 427 arrives at the museum, and parks. This was one of the last Cobra chassis built at Thames Ditton in the 1960s, for Paramount Pictures, to make pseudo-vintage cars. It was later rebuilt by AC with a Cobra body and 427 engine. 53 - Silver AC 428 convertible revs and then idles, heard from behind its exhausts. 54 - Red Austin Healey 3000. 55 - Black E-Type 4.2 and a dark blue Morris Minor. 56 - Metallic grey XK120 and dark red Triumph Stag (with 6 cylinder engine). 57 - A light blue E-Type slips by quietly, followed by a dark metallic green Ford Mustang, and a red Sunbeam Tiger (not so quiet!). 58 - A white MGB GT gets some wheel-slip on gravel, before departing, followed by a dark green Ford Mustang. 59 - A pair of Ford Mustangs (blue/white and yellow). 60 - A ride in a maroon 1949 AC 2 Litre Saloon in West Yorkshire. Edited sequence. 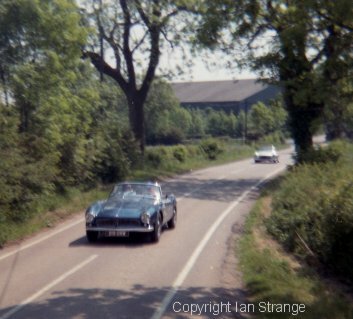 61 - Outside the sound-recordist's home (Leicester), a maroon Jensen 541 starts up, drives down the road, turns and returns. Edited sequence. 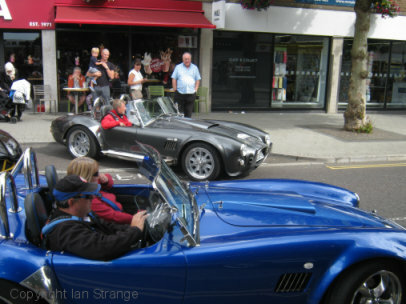 62 - A metallic red replica Cobra starts up and crawls slowly through the crowded shopping street. 63 - A bright metallic blue replica Cobra and then a grey version (both with modern Corvette engines) start up and leave slowly. A grey Porsche 911 Turbo follows up behind them. 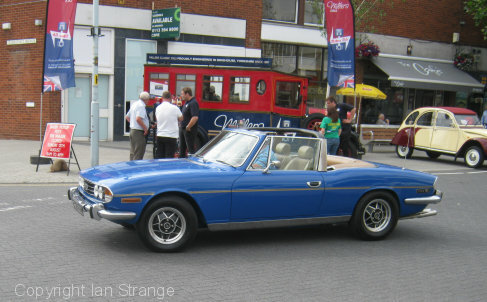 64 - A blue Triumph Stag heads off for home. 65 - A silver Daimler SP250 starts and departs, then a black replica Cobra (Corvette engine) also fires up, revs, and slips away quietly. A red Porsche 356 Speedster passes by. 66 - Prior to a parade of AC Cobras, the cars start up and leave the paddock. 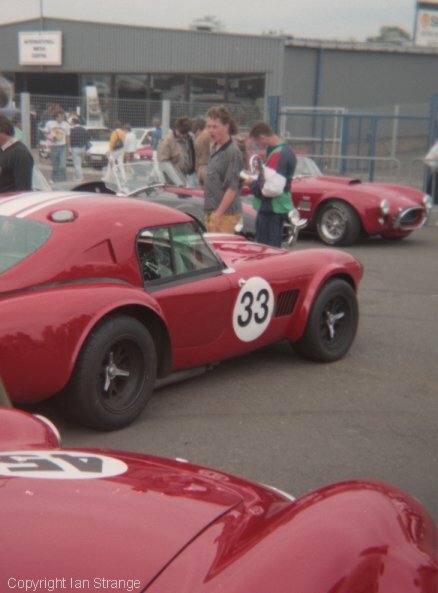 The Cobra starting a few seconds into the recording, is the car that won its class at LeMans 1963 (reg. no. 39 PE, racing number 33 below). There were over 20 AC Cobras, mostly original 1960s cars built at Thames Ditton, plus a few AC mark 4s built under licence in the 1980s. 67 - A race featuring 19 AC Cobras, mostly mark 2 289s, a mark 3 289, and some modern mark 4s. They are heard near the hair-pin, approaching at the far side, and then leaving the bend in the foreground. See bottom of home-page for further ordering details.